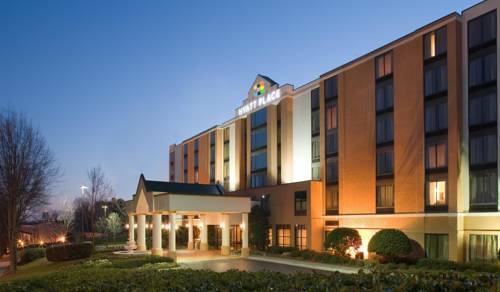 This is a 150 room hotel located in the heart of the Perimeter Business Center. Near shopping, fine dining and local transportation MARTA for convenient transportation to-from Hartsfield Airport, Downtown, Turner Field. All rooms have separate sitting area and sleeping areas. Plus, mini refrigerator, wet bar, coffee makers with coffee and decaf available. Enjoy our complimentary a.m. Kitchen Skillet, with hot breakfast items, fresh fruit, oatmeal and plenty more to choose from. Served daily in the Guest Kitchen. Ample complimentary parking and local shuttle transportation available. Meeting space on premises. PET POLICY: 1-6 NIGHTS A 75 NON-REFUNDABLE FEE. 7-30 NIGHTS A 75 NON-REFUNDABLE FEE PLUS AN ADDITIONAL 100 CLEANING FEE. MAXIMUM OF 2 DOGS PER ROOM ARE PERMITTED. WEIGHT MUST BE 50 LBS OR LESS MAX OF 75LBS PER RM. FEES ARE IN USD. 150 newly renovated guest rooms located in Georgia's largest business district, the Perimeter Center North of Atlanta. This suburban location is an outstanding alternative for both business and leisure guest as it is very accessible to all that Atlanta has to offer. 4PM Cancel - Must cancel by 4pm day of arrival to avoid loss of one nts room and tax. Early 20th century planes, cars, and memorabilia at the Peach State Aerodrome.